Marlene Dumas was joined by her colleagues Jan Andriesse and Bert Boogaard in creating a big new altarpiece for the Annenkirche in Dresden. The Protestant Church has not only preserved its fine built heritage, but has also commissioned artists down the ages to produce new liturgical works that breathe contemporary life into the faith. This new altarpiece for the Annenkirche draws on Christian motifs and explores their meaning in the story of Salvation, interpreting suffering with hope and illustrating how relevant religion is today. The church has been fully refurbished in recent years. The new altarpiece provides it once again with a spiritual and artistic focus. 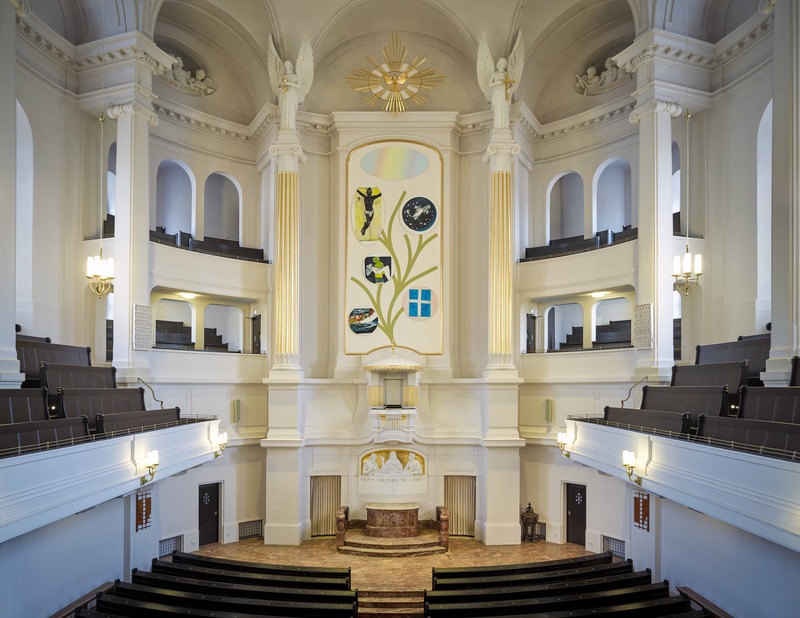 In the Lutheran parish that embraces both the Annenkirche and the nearby St Matthew’s Church, the interior restoration prompted reflections about a new, contemporary design for the altarpiece. Marlene Dumas agreed to take on the project. The choice of Marlene Dumas was unanimous, not least because her powerful human images evoke such strong emotions: they are at once relentless, tender and loving, borne by the artist’s tremendous empathy. The piece has been realised by the grateful support by donations, sponsors and the Evangelical Lutheran Church of Saxony. The consecration of the altarpiece on 26 March 2017 filled a painful vacuum for the Annenkirche congregation. The new altarpiece in the Annenkirche consists of five tondi by Marlene Dumas, a sixth by Jan Andriesse and a Tree of Life by Bert Boogaard to bind them together on the altar wall with 3,60 meters wide and 7,80 meters high. The motifs formulate major Christian and human issues in a manner which speaks directly to our lives today. In perhaps the most striking motif, Marlene Dumas draws on the image of the crucified Christ Free Jesus, but she liberates him from the cross, so he seems to float as if he already resurrected. Just as she transforms the colours: the blue sky behind the cross becomes radiant yellow, and the pale figure acquires a black body. This reversal recurs in another image of the cross: white on a blue background – The Cross becomes a Window. It resembles a window holding a promise as it looks out onto the heavens. Another tondo The Image as Burden is a moving depiction of two people: one is finding the strength to carry the other, who lies limp and lifeless in his arms. This is the motif of the Pietà, where Mary weeps for the dead Christ in her arms. But once again there has been a reversal: here the man is carrying a woman. For the Ship of Life The Refugees, Dumas has chosen a motif familiar from the news. It reminds one of the command to love your neighbour. The boat overcrowded with refugees seems to be in peril, like the boat that carried Jesus and his disciples across the Sea of Galilee in the storm. It also points upwards, like the ladder of angels that Jacob saw in his dream. This expresses God’s close bonds with the people in Earth, as does the Rainbow by Jan Andriesse. It symbolises not only the hope and Redemption, but also the beauty of Creation and out our obligation to preserve it. In her painting How far your Arms can reach (Starry Night) with which the Creation story begins, the artist left an area in the middle white because her arms could not stretch that far. This painterly ruse captures not only the separation of light and darkness, but also finite human powers. The Tree of Life by Bert Boogaard is composed as an ornamentation of abstract arc segments forming branches like arteries between the images and forging connections between them. The faith motifs hang from these branches and acquire a sense of motion, not least because of their spherical shape, pointing beyond the boundaries of the altar in to the lives of people – in the parish, in the Creation and in God. The altarpiece can be visited after services, at 12 noon on Sundays, or with the prior agreement of the parish office.